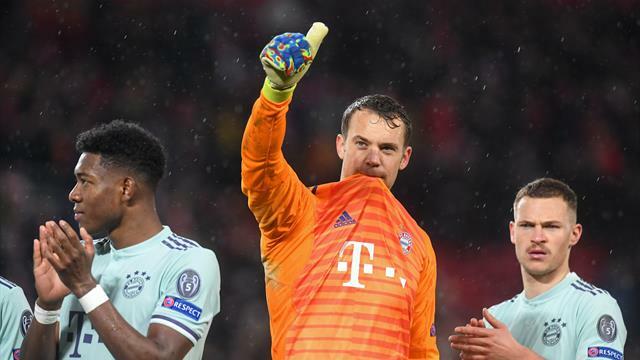 Bayern Munich produced a superb defensive display to keep Liverpool’s attack quiet, with a 0-0 draw at Anfield leaving their Champions League last 16 tie wide open. The opening stages were cagey before the Reds carved out some good opportunities with Mohamed Salah failing to find the target with a header while Sadio Mane screwed a shot wide from close range. But the best chance fell to Joel Matip whose first-time effort went wide. Bayern, without the experienced trio of Arjen Roben, Thomas Muller and Jerome Boateng, were limited to half-chances with Robert Lewandowski on the fringes and marked out of the game by makeshift defender Fabinho. Niko Kovac’s side did not exploit the absence of the suspended Virgil van Dijk but defensively got it spot on with Mats Hummels and the rest of the backline giving the home side little space to thrive. Jurgen Klopp threw on James Milner and Divock Origi in the latter stages, but it did not change the game as the German side held on for a deserved goalless draw. The Reds must now turn their attention to Sunday’s clash with Manchester United at Old Trafford. Who won the tactical battle between Klopp and Kovac? Few would have predicted a 0-0 with both side’s defensive frailties and injury list but the visitors' backline was brilliant, especially Kimmich and Hummels. They suffocated Liverpool’s attack and restricted them in the second period to few chances. As an attacking force, Koman and Gnabry looked dangerous but could not bring Lewandowski into the game. They missed the chance to get an away goal but Kovac will be pleased with his side’s organisation and work rate. Liverpool lost all three away games in the group stage so the Germans will fancy their chances. Fabinho (Liverpool): He was deployed as a centre-back due to the absence of Virgil van Dijk and Dejan Lovren. And the Brazilian was impressive with the timings of his tackles and outmuscling Lewandowski. Liverpool : Alisson 7, Alexander-Arnold 6, Matip 6, Fabinho 9, Robertson 5, Wijnaldum 5, Henderson 7, Keita 4, Mane 5, Salah 5, Firmino 5. Subs: Milner n/a, Origi n/a. Bayern: Neuer 6, Sule 8, Hummels 9, Thiago 5, Martinez 5, Lewandowski 4, Rodriguez 6, Gnabry 8, Alaba 5, Coman 8, Kimmich 9. Subs: Ribery n/a, Sanches n/a, Rafinha n/a. 23’ - CHANCE! The Reds have a free-kick near the corner flag after Sule pushes Mane. Alexander-Arnold's delivery to the near post is cleared, its crossed back in and Salah's header goes wide, he should have found the target from there. 33’ - WHAT A CHANCE! Keita's shot is well blocked by Sule, it falls to Mane who scuffs his effort wide from inside the box on the turn. 40’ - CLOSE! Lovely flick from Salah, Firmino cuts it back from the right and Matip puts it wide from close range. 59’ - CLOSE! Gnabry picks up a loose ball and his drive from around 25 yards flies narrowly over the bar, great effort. 85’ - CLOSE! The ball is swung in, Mane's header hits Sule and Neuer turns it around the post. The Reds are unbeaten in their last 20 European home outings, winning 14 and drawing six. Hummels, Martinez, Rodriguez and Thiago all made their 50th appearance in the Champions League.